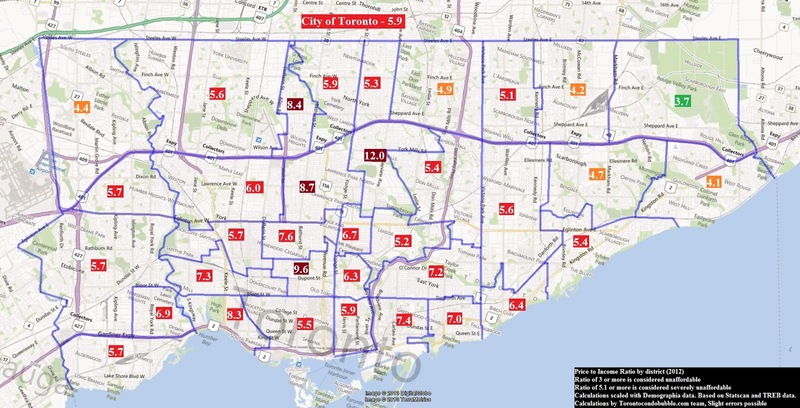 Above is a price to income map for the city of Toronto. Specifically, I divided median home price of each area by median household income of each area. I used TREB data from 2012, and then scaled statscan data with demographia's trend for the past seven years in order to achieve individual median household incomes for each district of the city. I would say that this graph is on the conservative side as it assumes 43% income growth between 2005 and 2013. Nevertheless, I think it is the pattern of the map that matters. It seems that the wealthiest areas like Yorkville and Forest Hill have the largest housing bubbles in Toronto. 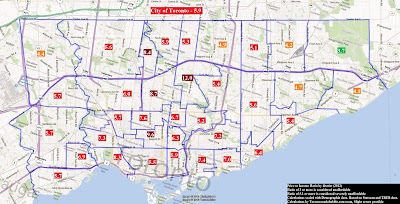 Additionally, the Danforth village and the Beaches have price to income ratios north of "7". The last two also had experienced the largest price growth in the city as prices went up more than 100% in the last ten years. Remember, any ratio above 5.1 is considered severely unaffordable. The price to income ratio for Toronto was 5.9 in 2012 according to demographia survey.